Tebworth | Where Angells Tread! It’s that time of year when, once again, I find I’m younger than I thought I was…for most a good experience…however it does mean retiring, and doing what I really want to do, is further away than I’d hoped…that thought always spoils the day. To overcome the disappointment we select another walk in our slow encirclement of Luton. The first part of our walk reprises the previous Toddington ‘not one of your better walks’ route, before emerging the other side of Toddington into Alma Farm. 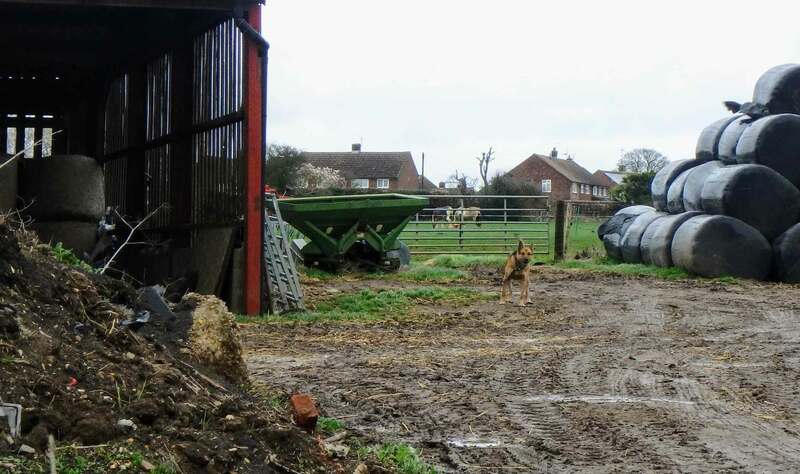 Picking our way through the muddy farmyard is given added spice by the accompaniment of snapping, snarling Alsatians and Rottweilers, thankfully chained. Nevertheless we’re left with the feeling of not being particularly welcome. For the rest of the walk we’re crossing large open fields under grey Bedfordshire skies. However, the big views leave little to hide the wildlife and several times we disturb deer hunkered down in the grass. We even stumble upon a group of boxing hares, too testosterone-fueled to spot us hoving into view over the horizon. We’re back at the car as the heavy shower, that the skies have been threatening all morning, finally arrives. It feels as if the Rottweilers have reappeared to chase us out of Bedfordshire today. An altogether forgettable 9.7 miles. Like you, I feel I should spend more here, but it is a challenging destination!